This text relives some of St Francis's experiences and tries to understand the complexity of history's popular Saint. ;James Cowan lived in Italy for three years walking in the footsteps of Francis, following his journeys, breathing his air and sleeping in his caves and grottoes. He discovered a man who, in a sense, de-institutionalized the medieval Church, who represented a mystical Christian tradition and stood up to leaders and theologians and all the great citadels of monastic influence. ;This attempt to enter the spirit of Francis is also a celebration of Italy and its ability to inspire imagination. - Publisher James Cowan lived in Italy for 3 years walking in the footsteps of Saint Francis and sleeping in his caves and grottoes. This book recalls his discoveries, arguing that, in a sense, Francis de-institutionalised the medieval Church. 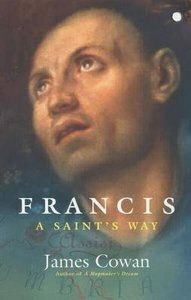 About "Francis - a Saints Way"
James Cowan lived in Italy for 3 years walking in the footsteps of Saint Francis and sleeping in his caves and grottoes. This book recalls his discoveries, arguing that, in a sense, Francis de-institutionalised the medieval Church.